Ahead of the upcoming the IAA Commercial Vehicles Show in Hanover from 20-27 September Mercedes Benz trucks has unveiled what it claims is the safest, most efficient and best connected truck ever with one particular innovation sure to get the discussion started on future truck design. 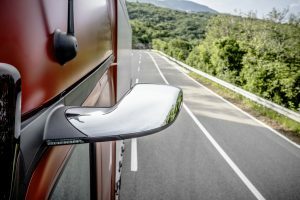 The advanced Actros has done away with conventional mirrors in a bid to reduce drag and fuel consumption, swapping the traditional mirrors for MirrorCam, which the company claims, gives a perfect all round view. Benz’s new MirrorCam makes mirror’s obsolete. The truck also boasts enhanced comfort and greater safety according to Benz and takes the maker closer to having a fully automated truck as it claims ‘automated driving starts here with new Active Drive Assist, MirrorCam for the perfect all-round view, Active Brake Assist 5 with further improved pedestrian detection, Traffic Sign Assist, electronic parking brake, Stability Control Assist for trailers, a new headlamp system with characteristic light signature, Highbeam Assist’. 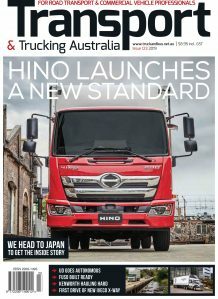 It seems like only as few months since the new Actros was launched in Australia, (in fact its actually almost two years since it was launched here) so any hope that we might see this new technology smorgasbord any time soon would be overly optimistic. Mercedes-Benz Truck and Bus Australia Pacific Director, Michael May says the local operation is excited to see this technology on display in Europe, but says it is too early to discuss details of when it might be available in Australia. “As demonstrated with the current Mercedes-Benz model range, we will only introduce technology into Australia when we are absolutely positive that it is right for our local customers and able to withstand our tough conditions,” he says. Given the current Actros took about five years to reach our shores it could be a while before the new one gets here but is likely to have a shorter gestation period than its forerunner. Our best guess is that the new Actros won’t arrive down under for at least three years. The truck has been ergonomically optimised with a digital driver cockpit, contemporary new infotainment options and a new interior lighting concept for increased comfort and efficiency. 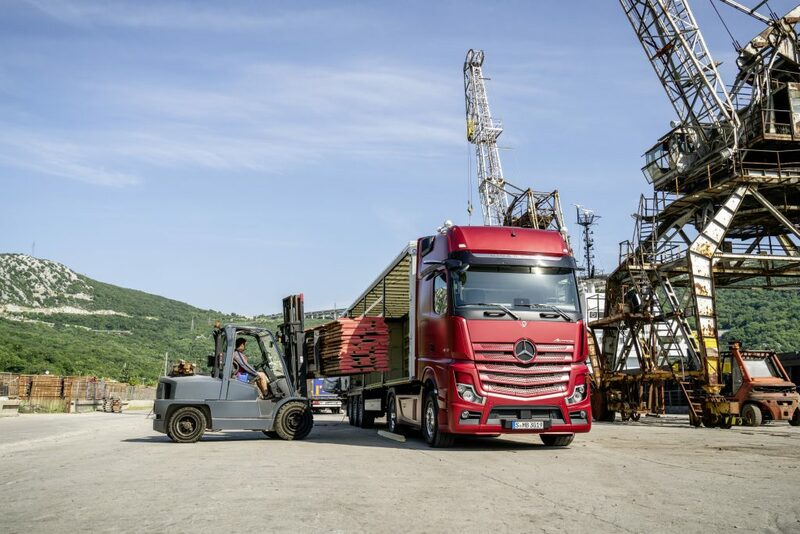 Benz says these innovative new features on the advanced Actros will also available for its related Arocs, heavy-duty construction vehicle line up. Mercedes-Benz unveiling its new flagship to the world’s press at the premiere night making it potentially the truck everyone will be watching when the doors open on Hanover on the 20th September from it characteristic light signature along the top of the headlamps to the futuristic- MirrorCam. Benz says the new Actros features pioneering innovations in a series production vehicle, which immediately pay off for the user. The company says the vehicle increases efficiency for business owners and comfort for drivers to a previously unattained level while fuel consumption has fallen noticeably and safety as well as vehicle availability have been increased further. 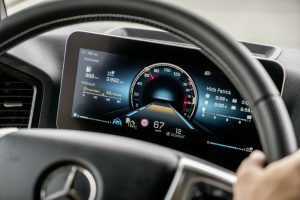 Benz says the opportunities provided by digitisation have been leveraged in order to achieve these advances and in particular cites the new multimedia cockpit, which it says is, delivers completely updated interface between the driver and vehicle. 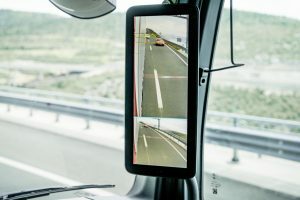 It claims the driver benefits from a seamlessly connected workspace with digital services and assistance systems, which it says can be used intuitively and support the drivers to operate even more effectively. The digital aspects also benefit fleet managers and scheduling teams because of the truck’s comprehensive connectivity they are able to monitor their trucks in real-time without interruption allowing necessary maintenance and logistics processes to be organised with immediate response possible in urgent cases. 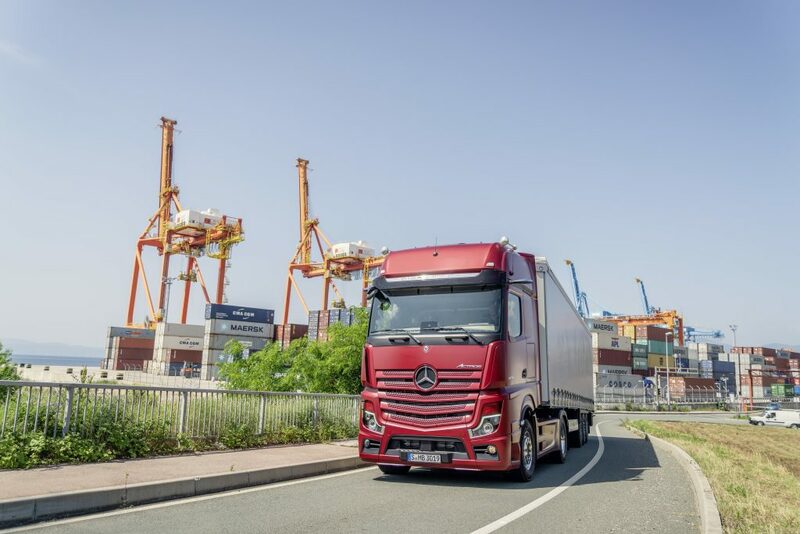 Benz says it will be taking orders for the new Actros from European customers new Actros from the start of the IAA show saying that the first vehicles will be delivered to customers in the European spring of 2019. The innovation that is sure to attract the most attention will be the revolutionary MirrorCam, it will be the first time camera technology has been used to replace mirrors in a series production truck, although it has been used in concept and prototype trucks. Digital cameras and displays replace the conventional main mirrors and wide-angle mirrors which Benz says it provides a considerably improved all-round view with performance which it says significantly exceeds legal requirements while reducing fuel consumption thanks to the aerodynamic advantages of the compact digital cameras. The cameras are attached to the right and left of the roof frame and the images captured are displayed on two 15-inch displays with a resolution of 720 x 1920 pixels. These are attached to the A-pillars inside the cab while also giving the driver a good, diagonal view past the A-pillars with an enlarged the field of view. Benz also says the coated lens provides optimal protection against dirt in the field of vision. The MirrorCam has multiple functions helping the driver: When driving forward, the classic and familiar division of the field of view is shown on the displays, just like with conventional mirrors. When taking corners in a prime mover unit, the image on the display on the inside of the bend is pivoted and thus provides an optimal view of the entire trailer – a considerable improvement compared to a conventional system of mirrors. Benz says distance lines help provide a clearer appraisal of the traffic behind. There is also an additional line that can be individually set, e.g. to show the end of the trailer, making precision manoeuvring easier while at dusk, the system switches to a night vision mode. Cam displays warnings in critical driving conditions. Some MirrorCam functionality can be customised. The brightness of the displays, for example, can be adjusted manually. As with conventional mirror adjustment, the field of view can be modified via the door control. At the touch of a button the driver can quickly revert to their preferred basic setting. Heat can also be applied to the camera system at the touch of a button. Being particular useful when driving, the MirrorCam is also beneficial when the driver is resting or sleeping: A switch on the door and one by the bed activates the system for two minutes at a time. This allows the driver to check the area around the vehicle at any time via the displays. If an attempt is being made to steal the load or fuel or the vehicle is being vandalised, this gives the driver a quick overview for raising the alarm if necessary. This system even works with the curtains closed and when the vehicle is completely switched off. A potentially useful feature when it comes to selling the vehicle later is that vehicles with MirrorCam can be retrofitted with conventional mirrors at pre-defined attachment points on the door structure. Benz says its Active Drive Assist is where automated driving starts giving drivers access to semi-automated driving at all speeds for the first time in a series production truck. New features include active lateral control and the combination of longitudinal and lateral control at all speed ranges by combining radar and camera information. The company claims Active Drive Assist builds on its previous Proximity Control Assist system with stop-and-go function as well as on the Lane Keeping Assist. Active Drive Assist brakes the truck if it gets too close to a vehicle driving in front and accelerates again until a set speed is reached. It also actively keeps the vehicle in lane. If the vehicle is leaving its lane unintentionally, Active Drive Assist intervenes and independently steers the vehicle back into its lane. The distance from the vehicle in front and the vehicle’s position in its lane can be adjusted in multiple stages using the driving assistance menu. When steering independently in lane, Active Drive Assist uses the new electrohydraulically assisted Servotwin steering system which in situations where the vehicle is not being driven semi-automated, supplements the steering torque applied by the driver with additional steering torque and improves driving comfort helping considerably when manoeuvring in tight spaces. It is claimed that the new Actros consumes up to three per cent less fuel on motorways and expressways and up to five per cent on rural roads thanks to its improved aero design, the use of MirrorCam and other features including the improved Predictive Powertrain Control system. It also features new concave-shaped cab side deflectors and an optimised design for the roof spoiler. Predictive Powertrain Control uses a satellite-based location system along with accurate digital maps and data about topography, bends, the geometric properties of junctions and roundabouts, as well as traffic signs. Benz says the system optimises the driving style to take uphill and downhill gradients into account as well as winding rural routes where the use of a cruise control was previously not ideal. The primary goal is to avoid unnecessary braking, acceleration or gear changes and moving the truck as fuel-efficiently as possible, giving optimal support to the driver when it comes to driving. Proximity Control Assist provides information about vehicles in front so the intelligent cruise control system can arrange the ideal shift operations and speed to make the best possible use of the vehicle’s momentum. Benz says its Predictive Powertrain Control will also now be available for heavy loads up to 120 tonnes, as well as for all-wheel-drive vehicles and vehicles featuring a hydraulic auxiliary drive or turbo retarder clutch. Active Brake Assist 5 is fitted to the new Actros, which Benz says has enhanced functionality based on a radar and camera system and can now respond to people at speeds of up to 50 km/h. It can also respond to a person who is crossing in front of the vehicle, coming towards it or in the same lane by applying maximum braking power to standstill. The same applies to pedestrians who unobservantly walk in front of the vehicle and who may ‘freeze’ – a situation which is happening more and more often in this smartphone age. If Active Brake Assist 5 detects the threat of a rear-end collision with a vehicle in front, with a stationary obstacle or a pedestrian who is crossing in front, coming towards the vehicle or in the same lane, a three-stage warning system makes the driver aware of the threat. If the driver does not take action independently, a visual and audible warning is given first. After this, brake application of approximately 3 m/s is initiated, corresponding to around 50 percent of the maximum braking power. If the driver still hasn’t responded, the system initiates maximum braking power – if necessary to a standstill – and activates the hazard warning lights at speeds below 50 km/h to warn the traffic behind. When at a standstill, the new electronic parking brake is applied automatically. The new Actros is clearly chock full of the latest technology but as we say with the current Actros only just starting to establish itself in the Australian market it may be some time before we see this new machinery down under.